We have discussed earlier how plants take in simple compounds such as CO2 and photosynthesise energy stored in their chlorophyll-containing organs, namely leaves. The other kinds of raw materials needed for building plant bodies will also have to be taken up separately. For plants, the soil is the nearest and richest source of raw materials like nitrogen, phosphorus and other minerals. The absorption of these substances therefore occurs through the part in contact with the soil, namely roots. If the distances between soil-contacting organs and chlorophyllcontaining organs are small, energy and raw materials can easily diffuse to all parts of the plant body. But if these distances become large because of changes in plant body design, diffusion processes will not be sufficient to provide raw material in leaves and energy in roots. A proper system of transportation is therefore essential in such situations. Energy needs differ between different body designs. Plants do not move, and plant bodies have a large proportion of dead cells in many tissues. As a result, plants have low energy needs, and can use relatively slow transport systems. The distances over which transport systems have to operate, however, can be very large in plants such as very tall trees. Plant transport systems will move energy stores from leaves and raw materials from roots. These two pathways are constructed as independently organised conducting tubes. One, the xylem moves water and minerals obtained from the soil. The other, phloem transports products of photosynthesis from the leaves where they are synthesized to other parts of the plant. We have studied the structure of these tissues in detail in Class IX. In xylem tissue, vessels and tracheids of the roots, stems and leaves are interconnected to form a continuous system of water-conducting channels reaching all parts of the plant. At the roots, cells in contact with the soil actively take up ions. This creates a difference in the concentration of these ions between the root and the soil. Water, therefore moves into the root from the soil to eliminate this difference. This means that there is steady movement of water into root xylem, creating a column of water that is steadily pushed upwards. However, this pressure by itself is unlikely to be enough to move water over the heights that we commonly see in plants. Plants use another strategy to move water in the xylem upwards to the highest points of the plant body. Take two small pots of approximately the same size and having the same amount of soil. One should have a plant in it. Place a stick of the same height as the plant in the other pot. Cover the soil in both pots with a plastic sheet so that moisture cannot escape by evaporation. Cover both sets, one with the plant and the other with the stick, with plastic sheets and place in bright sunlight for half an hour. Do you observe any difference in the two cases? Provided that the plant has an adequate supply of water, the water which is lost through the stomata is replaced by water from the xylem vessels in the leaf. In fact, evaporation of water molecules from the cells of a leaf creates a suction which pulls water from the xylem cells of roots. The loss of water in the form of vapour from the aerial parts of the plant is known as transpiration. 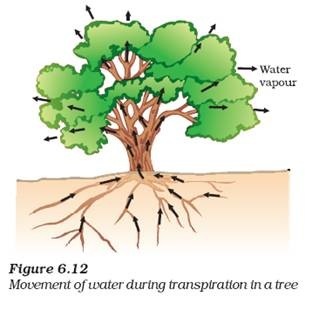 Thus, transpiration helps in the absorption and upward movement of water and minerals dissolved in it from roots to the leaves. It also helps in temperature regulation. The effect of root pressure in transport of water is more important at night. During the day when the stomata are open, the transpiration pull becomes the major driving force in the movement of water in the xylem. So far we have discussed the transport of water and minerals in plants. Now let us consider how the products of metabolic processes, particularly photosynthesis, are moved from leaves, where they are formed, to other parts of the plant. This transport of soluble products of photosynthesis is called translocation and it occurs in the part of the vascular tissue known as phloem. Besides the products of photosynthesis, the phloem transports amino acids and other substances. These substances are especially delivered to the storage organs of roots, fruits and seeds and to growing organs. The translocation of food and other substances takes place in the sieve tubes with the help of adjacent companion cells both in upward and downward directions. Unlike transport in xylem which can be largely explained by simple physical forces, the translocation in phloem is achieved by utilizing energy. Material like sucrose is transferred into phloem tissue using energy from ATP. This increases the osmotic pressure of the tissue causing water to move into it. This pressure moves the material in the phloem to tissues which have less pressure. This allows the phloem to move material according to the plant’s needs. For example, in the spring, sugar stored in root or stem tissue would be transported to the buds which need energy to grow.